Dr. Morris' research interests include HIV-associated lung disease as well as the role of the microbiome in disease. 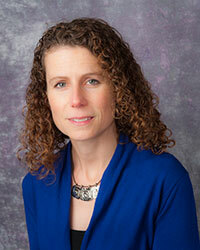 Her group works with large cohort epidemiologic studies of HIV and other diseases as well as in translational studies in which physiologic and molecular techniques are applied to patient populations. As part of her role in the Center for Medicine and the Microbiome, she works with collaborators in diverse areas studying the microbiome. Dr. Morris’ clinical interests focus on lung disease in HIV-infected patients and in care of intensive care unit patients. Segal LN, Clemente JC, Tsay JJ, Koralov SB, Keller BV, Wu BG, Yonghua L, Shen N, Ghedin E, Morris A, Diaz P, Huang L, Wikoff WR, Ubeda C, Artacho A, Rom WN, Sterman DH, Collman RG, Blaser MJ, Weiden MD. Enrichment of the lung microbiome with oral taxa is associated with lung inflammation of a TH17 phenotype. Nature Microbiology. 2016; 1: 16031. Fitzpatrick, ME, Nouraie, M, Gingo, MR, Camp, D, Kessinger, CJ, Sincebaugh, JB, Clarke, A, Ries, JW, Kleerup, EC, Kingsley, L, Morris, A. Novel relationships of markers of monocyte activation and endothelial dysfunction with pulmonary dysfunction in HIV-infected persons. AIDS. 2016; 30(9): 1327-39. Cribbs, SK, Uppal, K, Li, S, Jones, DP, Huang, L, Tipton, L, Fitch, A, Greenblatt, RM, Kinglsey, L, Guidot, DM, Ghedin, E, Morris, A. Correlation of the lung microbiome with metabolic profiles in bronchoalveolar lavage fluid in HIV infection. Microbiome. 2016; 4: 3. Cui, L., Lucht, L., Tipton, L., Rogers, M.B., Fitch, A., Kessinger, C., Camp, D., Kingsley, L,, Leo, N., Greenblatt, R.M., Fong, S., Stone, S., Dermand, J., Kleerup, E., Huang, L., Morris, A. *, Ghedin, E.*. Topographical diversity of the respiratory tract mycobiome and alteration in HIV and lung disease. American Journal of Respiratory and Critical Care Medicine. 2015; 191: 932-42. Moller, DR, Koth, LL, Maier, LA, Morris, A, Drake, W, Rossman, M, Leader, JK, Collman, RG, Hamzeh, N, Sweiss, NJ, Zhang, Y, O'Neal, S, Senior, RM, Becich, M, Hochheiser, HS, Kaminski, N, Wisniewski, SR, Gibson, KF. GRADS Sarcoidosis Study Group. Rationale and design of the Genomic Research in Alpha-1 Antitrypsin and Sarcoidosis Study: Sarcoidosis Protocol. Annals of the American Thoracic Society. 2015; 12(10): 1561-71. Fitzpatrick, ME, Gingo, MR, Kessinger, CJ, Lucht, L, Kleerup, E, Greenblatt, RM, Claman, D, Ponath, C, Fong, S, Huang, L, Morris, A. HIV infection is associated with diffusing capacity impairment in women. Journal of the Acquired Immunodeficiency Syndrome. 2013; 64(3): 284-8. Morris, A, Beck, JM, Schloss, PD, Campbell, TB, Crothers, K, Curtis, JL, Flores, SC, Fontenot, AP, Ghedin, E, Huang, L, Jablonski, K, Kleerup, E, Lynch, SV, Sodergren, E, Twigg, H, Young, VB, Bassis, CM, Venkataraman, A, Schmidt, TM, Weinstock, GM. Comparison of the respiratory microbiome in healthy non-smokers and smokers. American Journal of Respiratory and Critical Care Medicine. 2013; 187(10): 1067-75. Gingo, MR, George, MP, Kessinger, CJ, Lucht, L, Rissler, B, Weinman, R, Slivka, WA, McMahon, DK, Wenzel, SE, Sciurba, FC, Morris, A. Pulmonary function abnormalities in HIV-infected patients during the current antiretroviral therapy era. American Journal of Respiratory and Critical Care Medicine. 2010; 182(6): 790-6. Morris, A, Kinglsey, LA, Groner, G, Lebedeva, IP, Beard, CB, Norris, KA. Prevalence and clinical predictors of Pneumocystis colonization among HIV-infected men. AIDS. 2004; 18(5): 793-8.